Blood sugar is literally that: the sugar in your blood. Your blood contains all kinds of important nutrients and other substances that we need to be healthy. Including sugar. Blood is the liquid transporter that distributes these compounds to all parts of our bodies. Sugar (a type of simple carbohydrate) is one of our body’s main fuels. The other two fuels are fat and protein. I call it “fuel” because our cells literally burn it to do work. It’s this “biochemical” burning of fuel in all of our cells that is our metabolism. So, how does blood sugar get too high? What diet and lifestyle upgrades can we do to manage it? How does blood sugar affect mood and energy? In this post, I’ll talk a bit about blood sugar balance, insulin resistance, and diabetes. Then I’ll give you 11 proven strategies that can help manage blood sugar level naturally to help you keep your mood and energy more consistent. The good news is that blood sugar levels are responsive to simple diet and lifestyle upgrades. You have power to help manage your blood sugar with these key strategies! NOTE: There are several medical, diet, and lifestyle approaches to managing medical conditions. None of these are a substitute for professional medical advice. If you have any of these conditions, or are taking medications for it, please make sure you’re being monitored regularly. Our body strives to be in balance. It exerts a lot of energy to make sure that our systems are all running smoothly. Our digestive system, nervous system, cardiovascular (heart & blood vessels) system, etc. And this includes our blood too. Our bodies try to balance our blood pressure, blood volume, blood sugar, etc. There is a normal and healthy range of sugar levels in our blood. The problem doesn’t start until these levels are out of range, i.e. too high for too long. We eat a food containing carbohydrates (i.e. sugar and/or starch). Our digestive system breaks down the sugar and/or starch into smaller sugars like glucose. These smaller sugars are then absorbed into our bloodstream. This naturally raises our blood sugar level. When our blood sugar gets too high, the pancreas (a gland in our digestive system) sends out insulin. Insulin is a hormone that tells our muscles, liver and, ultimately, fat cells to grab that sugar from the blood. These cells use the sugar they need for energy now, and store the rest for later. The muscles and liver store sugar (e.g. glucose) temporarily. When we need it, our muscles and liver give up their sugar into the blood. This happens, for example, when we haven’t eaten for a few hours, we’re exercising, or we’re under stress. The fat cells turn the excess sugar into fat for longterm storage. As you can see, the amount of sugar in your blood is constantly flowing up and down. Up when we eat; down when the insulin tells the cells to pull it out of the blood. Then up again when we eat again and/or start using some of the stored glucose. And down again as it’s used (burned) or stored. This is all good and healthy! This is what we aim for. The problem is when the balance is thrown off. When the blood sugar ups and downs become unhealthy. When the “ups” get too high, and they stay there for too long. Too much blood sugar can cause heart rate issues (arrhythmias), and in extreme cases, even seizures. Too high blood sugar for too long can eventually cause long-term damage to organs and limbs. A healthy blood sugar balance is key. A common way our blood sugar gets too high is when we eat a lot of sugar in a short time. Especially processed sugar, like in soda pop, energy drinks, desserts, etc. Our digestive system absorbs as much sugar from our food as possible. This is an evolutionary thing. We inherited this from thousands of years ago when food was scarce and the next meal was unknown. Our bodies adapted to crave, absorb, and store as much sugar as possible in one sitting, because it didn’t know how long it would be until the next meal. It’s a survival mechanism. Over the years, if we frequently eat a lot of sugar and have increased body fat, our bodies can change. The muscle and liver cells start ignoring insulin’s call to absorb sugar from the blood. They become “insulin resistant.” When this happens, the sugar stays in the blood for a lot longer than normal. Blood sugar levels become too high for too long. But this doesn’t stop the pancreas from releasing even more insulin. When this happens you have the paradox of high blood sugar and high insulin. Having levels of blood sugar and insulin that are too high is not healthy. In fact, it can be dangerous and lead to pre-diabetes, and eventually type 2 diabetes. Type 2 diabetes is a long-term (a.k.a. “chronic”) condition of too high blood sugar, insulin resistance, and inflammation. It increases the risk of many serious conditions like heart disease, kidney disease, blindness, and amputation. Not to mention the number of medications often prescribed to try to keep blood sugar balanced. DIABETES TYPE 1 vs. TYPE 2: Type 1 diabetes is a condition where your immune system actually destroys the insulin-producing cells in your pancreas. It’s an “autoimmune” condition where your pancreas literally cannot make insulin. This is often diagnosed early in life (childhood/adolescence) and requires lifelong insulin injections. Less than 10% of people with diabetes have type 1 diabetes; everyone else has type 2. These are the connections between blood sugar balance, insulin resistance, diabetes, and their symptoms and risks. Blood sugar also influences mood and energy levels. Have you ever felt “hangry”? You know that feeling when you are hungry and angry at the same time? Where you will eat anything you can reach to help you feel better? Where you are snapping at your kids, who are probably also getting hungry? This hangry feeling can be a result of low blood sugar where your body is craving a quick source of energy to help it maintain balance. Your body needs energy – it doesn’t realize that you have plans for dinner in an hour. When you respond by eating something high in sugar which provides quick energy, your brain releases feel good chemicals like dopamine to reward you. Your body wants to ensure you avoid starvation so it rewards you for eating something. Your mood improves quickly with a boost of sugar. But this energy boost won’t last long, and it can lead to a cycle of dramatic mood and energy changes. Feeling hangry, then feeling good. This repeated dopamine release is what makes sweet foods hard to resist; it is the same feel good chemical that is released by drug use. The feelings that come with eating a cookie or chocolate bar are designed to help you keep your blood sugar balanced, but with so much access to quick, sweet treats it is easy to over do it. Blood sugar imbalances have been associated with symptoms of depression, possibly because sugar contributes to inflammation. Read more about inflammation and mental health here. Blood sugar imbalances have also been related to anxiety and panic attacks since increases in blood sugar can signal the body to move in to flight or fight mode, even when it isn’t necessary. The good news is that improved blood sugar balance can be achieved with proper nutrition and lifestyle! What you eat, how you eat it, how much exercise and sleep you get, and how you handle stress are all factors that you can improve. CAUTION: If you’re already diagnosed, and/or taking medications or insulin injections, make sure you speak with your doctor and/or pharmacist before making any changes. They may also want to monitor your blood sugar levels a bit closer when you start making diet and lifestyle upgrades. Here are my 11 best tips to help you better balance your blood sugar with diet and lifestyle upgrades. First things first. If a food or drink is mostly sugar, please try to reduce, or even cut it out of your diet. I’m talking sweetened beverages (e.g. soda pop, juice, energy drinks, candy, etc.). Many desserts, breakfasts, and even seemingly-healthy choices like some granola bars often have a lot of sugar. Significantly reducing these will give you the most bang for your buck when it comes to better blood sugar levels. That’s why it’s my number one recommendation – I’ve even written a whole blog post about the benefits of cutting back on sugar. Your body digests starches by breaking them down into sugar. By reducing the amount of sugars and starches (carbohydrates) you eat, you can reduce that blood sugar spike that happens right after you eat. This has been shown in many studies. It’s been said that one of the strongest predictors of blood sugar response is the total amount of carbohydrates in a meal. Reducing your overall carbohydrate intake can help to reduce your blood sugar levels. If you’ve already cut out a lot of sugary foods and want to reduce your starch intake, then start by ditching the “high glycemic” (i.e. ones that raise your blood sugar too high) starches. As you can imagine, researchers have measured how fast and how high blood sugar increases with different foods. Foods that are “high glycemic” quickly raise blood sugar quite high. “Low glycemic” foods raise blood slower and to a smaller extent. High glycemic foods (i.e. ones to avoid) include sugary foods, as well as starchy foods like white bread, many pastas, and rice. Low glycemic foods include ones that are higher in fibre, fat and protein. Examples are meat, seafood, eggs, legumes, sweet potatoes, and most fruit and non-starchy vegetables. You’ve heard that “fibre makes you regular,” right? It’s so healthy. Most people don’t eat nearly enough. The recommended daily intake of fibre for adults is 21 g – 38 g per day. This nutrient is not just for “regularity” and gut health, but also for blood sugar balance too. It works by mixing with the carbohydrates in your meal, and slowing down the absorption of the sugars from those carbohydrates. Some of the highest fibre foods include cocoa powder, flaxseeds, & legumes. Feel free to add a spoon of cocoa powder to your smoothie, sprinkle flaxseeds on your cereal, and/or add some legumes to your soup or salad. Here are some suggestions for breakfast recipes that are lower in sugar, less inflammatory, higher in fibre and have a lower glycemic index to start your day off right. Since blood sugar is affected by the amount of carbohydrates you eat, studies have also looked at the order in which you eat different foods. A few small studies looked at adults with type 2 diabetes. They all had the same meal, but some were asked to eat their protein and fibrous (i.e. non-starchy) vegetables first; while others ate their carbohydrates first. They found that people who ate the protein and vegetables first had better blood sugar control. One of the studies also showed lower levels of post-meal insulin when the carbohydrates were eaten last. Another study found these blood sugar benefits to be true even in people without type 2 diabetes. It’s thought that when we eat carbohydrates first, we start digesting them right away. But, if we eat them after our protein and fibrous vegetables, they have a chance to mix in with the rest of the food in your stomach. This can slow down their absorption, which slows down how fast and high our blood sugar gets after we eat. The effects of changing food order hasn’t been tested in many big studies, but it seems to be a simple and safe habit to get into to help our bodies better regulate blood sugar levels. Try to eat your protein and fibrous vegetables first, and starches last. Unless your doctor or health practitioner has said otherwise, or you have an intolerance to them, fruit and the fruit sugar “fructose” are generally ok. Fructose has a low glycemic index. Having fructose instead of glucose (regular sugar) can reduce a measure of the average levels of blood sugar over the past two to three months (e.g. HbA1c – a blood test for blood sugar control). A diet high in fruits and vegetables is great for your health. They contain phytochemicals (phyto=plant), vitamins, minerals, and fibre. Eating whole (not processed or juiced) fruits can help with blood sugar balance. Berries are particularly good, as they contain a lot of fibre and not a lot of sugar. Not to mention that they’re delicious! Berries, especially dark berries, contain pigments known as “anthocyanins.” These dark-coloured pigments have lots of health benefits including helping sugar metabolism in people with insulin resistance. They can also improve ability to think, and their antioxidant effects are linked to reduced DNA damage. You can get enough anthocyanins from a regular serving of dark berries, so give them a try. Try having two tablespoons of vinegar shortly before or with a meal that contains sugars or starches. Why? Because a recent analysis of several studies (a meta-analysis) showed that the vinegar can lower the blood sugar by up to 60% and the insulin by up to 130% compared to the same meal without vinegar. This worked for insulin-resistant people. Even healthy people had a significant benefit. Cinnamon can help to lower blood sugar levels and improve insulin sensitivity. This effect can happen with even less than one teaspoon per day. It’s thought that cinnamon works by slowing the emptying of the stomach. Slower emptying means slower absorption and slower blood sugar rise after a meal. Cinnamon also contains antioxidant polyphenols (plant chemicals) that may improve insulin sensitivity. Our bodies are wired to work along the sun’s schedule. The objective is to wake up when the sun comes up, and get tired when it goes down. Not enough sleep can affect many of our body’s systems, including negatively affecting our blood sugar levels and insulin sensitivity. It can also increase appetite and promote weight gain. Sleep can also affect our mood and mental health. Even one or two nights of poor sleep can affect our blood sugar levels. Regularly getting enough good quality sleep is a great step toward helping our bodies manage blood sugar. Remember how insulin tells your muscle cells to pull some sugar out of your blood to store for later? Guess what it’s storing it for? By exercising and burning that stored sugar, you not only improve your blood sugar levels, and your physical and mental health in many ways, but also can reduce insulin resistance. Win-win-win. This means your muscle cells, especially when they’re moving, absorb and burn more sugar from the blood. This goes for both medium- and high-intensity exercise. Remember we talked about a couple of those things that releases sugar stored in the liver and muscles, and delivers them back to the blood? Things like not eating for a few hours, and when we’re under stress. Let’s talk about the blood sugar effect of stress hormones like cortisol. The reason stress hormones release stored sugar is to prepare for the “fight or flight” reaction. Your body becomes physically ready to fight or run. And to do this, you need fuel in your blood, i.e. sugar. How can you reduce stress? Relaxation techniques like deep breathing, meditation, and yoga can help to reduce stress and lower blood sugar levels. This is kind of a big and super-complex one, so I left it until the end. There is a ton of evidence that belly fat, overweight, and obesity are linked with blood sugar balance issues and type 2 diabetes. Weight loss and reduced waist circumference can work as well as, if not better, than medications. If your blood sugar is creeping up, there are some nutrition and lifestyle upgrades you can make for better health. Which of these strategies can you use to help you to better control your blood sugar levels? Shishehbor, F., Mansoori, A. & Shirani, F. (2017). Vinegar consumption can attenuate postprandial glucose and insulin responses; a systematic review and meta-analysis of clinical trials. Diabetes Research and Clinical Practice. 127, 1-9. https://doi.org/10.1016/j.diabres.2017.01.021 LINK: http://www.sciencedirect.com/science/article/pii/S0168822716308518#! Do you feel burnout or overwhelmed? Are you feeling unsure how to get back to your happy self and stay there? Are you searching for ways to feel better? This ebook will provide you with more than 50 holistic strategies to help you feel happier and healthier, starting today. 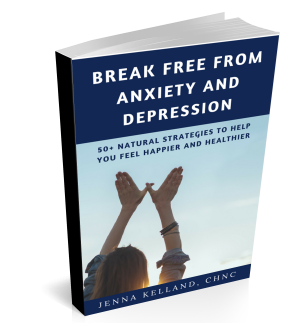 Break Free From Anxiety & Depression will provide you with more than 50 holistic strategies to help you feel happier and healthier, starting today. Please Send me the Checklist! Get a free 15-minute individual consultation when you join our mailing list to receive updates about brain health and mental healthy to keep you and your family happy and healthy! Success! I look forward to talking!